Features Archives - Somatone Interactive, Inc.
We are honored to be working with Firelight to bring you a series of feature and tutorial videos for the new release of FMOD 1.10. It is packed with some fantastic new capabilities, broadly grouped under three categories: Live Update, Per Platform Optimizations, and Smart Presets. These greatly increase the speed and flexibility of working in FMOD, and one of my favorites is the new Live Update feature that allows you to swap out audio files without requiring a new build of the game! I call this Hot-swapping, and the scenario where this is most useful is when working with clients who send us builds of the game with Live Update. We can test out different sounds realtime, while the game is running, without needing to ask the developer for a new build. This feature alone makes the update to 1.10 a no brainer, but with all the other improvements and features, it seems like this is one of the most important updates to FMOD Studio in a long time. To Download FMOD 1.10 for free, simply head over to the FMOD Website. Large projects can have thousands of events, creating a huge challenge for developers. Smart presets provide an innovative workflow solution to managing parameters, effects, and automation across events in you project. This feature greatly improves scalability while also reducing the project’s memory footprint. Smart Presets allow you to link any number of events and have changes propagate across your project. Provide a dynamic and scalable workflow that is fast and easy to iterate on. Live Update allows you to create audio content and monitor the results while connected to your game in real time. You can mix, iterate, test and optimize your entire project in real-time with instant feedback. Interactive media provides a unique challenge for sound designers. Live update provides a powerful workflow to improve the audio design of your game. All in a workflow designed for games. Getting the audio right for each platform requires an understanding of the key features and limitations each platform, such as: what audio codecs are available, is there a limit to download size, how much RAM is available, how powerful is the CPU, and other questions that you need to understand to deliver the best audio experience you can. 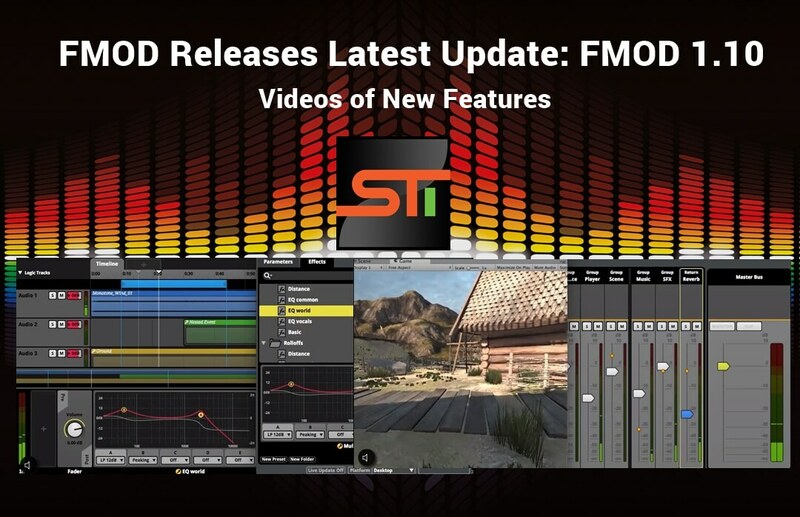 FMOD studio makes it easy to develop and optimize by making one project and exporting to multiple platforms. In the project we can set encoding formats and loading strategy for each platform and, new in 1.10, we can set which content and DSP plays on which platform. The general range of platforms runs from Desktop, with the least limitations, to Mobile, with the most limitations. On a desktop you generally have lots of memory, a powerful CPU, and unlimited download size. Whereas on mobile, you have limited memory, a less powerful CPU, a small download size and the added limitation of battery capacity. These limitations affect how we design and implement audio for each platform. For more info go to the FMOD Website.